Here’s a more detailed exposition, along with further resources and alternatives, to help you keep up the scientific literature. You can use RSS feeds to receive updates from your favorite journals; in addition, you can used saved searches in PubMed and in other engines to receive updates when articles matching certain keywords are published. RSS is also useful to subscribe to scientific blogs like this one. I highly recommend feedly as an RSS reader. RSS is fine for keeping up with a handful of journals, but the lack of filtering makes it an impractical solution to keep up with all the latest developments. Thankfully, newly minted recommendation engines do a very good job at this. There are two recommendation engines worthy of note: Google Scholar, which is very well known, and PubChase, which is a relative newcomer which I highly recommend over Scholar if you work in the biological sciences. Scholar is great, but its big flaw is that uses your currently published papers to recommend new ones; perhaps what you’d like to read now and what you’ve published so far are different things. PubChase uses whatever library of papers that you give it to create recommendations, either from your Mendeley account or from a BibTex file, which can be exported from Zotero, EndNote, Papers, etc. Its recommendations, which are updated daily are spot-on; it sends you an email every week with a big list of recommended papers to remind yourself of what you should be reading. See here for a more thorough review [xcorr]. RSS and recommendations will tell you what to read, but how do you organize your reading stack? You could put a bunch of PDFs in a folder, or print every paper you want to read immediately, but a much more manageable solution, IMHO, is to store references in a citation manager. Zotero is my preferred citation manager; it lives inside of Firefox, and it automatically detects references to papers when you browse a relevant website. You can then save the reference to your library, and the referenced PDF will be saved both locally and in the cloud; a 20$ a year plan will give you 3GBs of online storage, while for free you’ll have 300 MBs. Cloud-based storage means you will have access to your library whether you’re on your work computer, your home computer, your tablet, etc., irrespective of paywalls. You can then flag papers to read, papers you’ve read, etc. via folders or tags. You can add comments to each citation, and with a plugin, it can extract comments and annotations that you’ve written in the PDF. Very slick. Mendeley also offers cloud-based storage, but lives in a standalone app; Zotero-like web scraping is offered via a bookmarklet. Personally I prefer Zotero but it may simply be because I’ve been using it for a long time. By using a citation manager to keep track of your papers, you have the added advantage that when you write a paper, the relevant citations will already be in your library. Of course, there are other citation managers of note. I thoroughly detest EndNote. I do hear good things about Papers, which unfortunately locks you into the Mac ecosystem; I thoroughly detest Macs, if only for the reason that you end up paying twice as much for the same hardware and you can hardly customize it. You’ve found papers and added them to your library; you could print them out, but how about reading them on your tablet? A tablet offers a much more tactile viewing experience than a computer screen, and it’s highly portable, so you can read on the plane, train, or while eating delicious, delicious pad thai. PaperShip [see video demo here] is an app for the iPad that allows you to read papers from either your Mendeley or your Zotero library. Unlike ZotPad or Mendeley for iPad, it’s not a mobile version of your citation manager. Rather, it’s focused on reading papers seamlessly, which is great thing. It downloads PDFs in the background when it’s on wifi, so you have offline access to your papers. 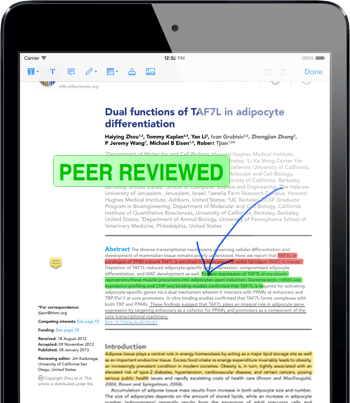 You can read the PDFs directly in-app; for a 5$ upgrade, it will allow you to annotate you PDFs with a very user-friendly interface. Annotations to PDFs are automatically synced back to your Mendeley or Zotero library. I’ve been using it for close to a month and I can’t say enough good things about it. An equally usable – if more expensive – alternative is Papers; again, you’ll need a Mac to actually fill your library. Unfortunately, I have yet to find such a completely satisfactory solution for Android tablets. ZotFile can send PDFs to you DropBox account, but you will need wifi to read the PDF. My own efforts on this problem have been put to rest for lack of time. Perhaps the people at Shazino, the makers of PaperShip, can get a crowd-funded effort to bring their app to Android tablets, now that ZappyLab has succesfully funded protocols.io. There you have it: a complete solution for keeping up with the scientific literature, from finding papers to organizing them and reading them on your tablet. Obviously, the most important step is to actually read the damn things! Happy reading. And of course, remember to read the Mo Papers Mo Problems blog. I think you can save yourself a lot of trouble by using a single citation manager. Zotero keeps a local copy of your references, it exports to BibTex, and it’s open-source, so most of the points in the linked post are moot.